You can walk back home from the rockin' Jolly Mon Bar. Big screen sports bar with billiards, shuffle board, darts and horseshoes! The really cool and talented Agave Blues band will rock your world every Friday night. Dancing included! A variety of entertainment available on many other nights. 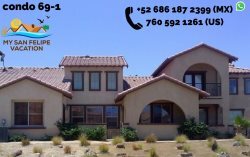 Located just 1/2 mile south of El Dorado Ranch. Don't miss this world famous Spring Break night club destination. Full bar, music and dancing into the wee hours of the night. Located on the 'main downtown drag', the Malecon. You can't miss it...just look for the giant green crocodile!